Pashupathinath temple, located on the banks of the holy Bagmati, is one of the holiest places on the planet and one of the most popular temples outside India. 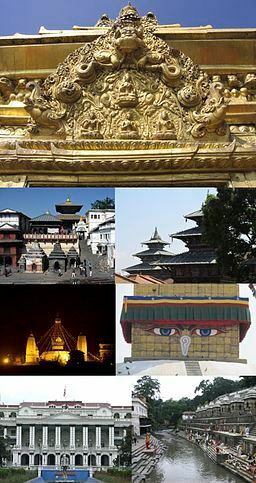 The temple is the oldest Hindu temple in Khatmandu and a UNESCO World Cultural Heritage site. The temple has been referred to in many ancient texts and Lord Pashupathinath literally means 'Lord of all living beings.' As with most temples associated with Adi Sankaracharya, the great Hindu philosopher, the priests at this temple too are from the south of India. The most important feature of this temple is that the Lord is represented by an ultra holy four-faced Shivalinga. Each of the four faces, which face the four directions, is associated with a significance. The face that faces the east is known as 'Tatpurusha', the face that faces the west is known as 'Sadhyojata' and the faces to the north and south are termed as 'Vamadeva' and 'Aghora' respectively. These faces also represent the four 'Dharmas' and the four 'Vedas'. This beautiful Shivalinga can be worshipped from a narrow walk that engulfs the Sanctum. The Sanctum also houses the images of Lord Vishnu, the Sun God, Goddess Devi and Lord Ganesha. The temple is 'Pagoda' style with two tiers and has gilded doors on all four sides. The niches on the either side of these doors house beautiful gilded images of guardian deities and various Gods of the Hindu pantheon. Artistic carvings, notably of the Sun, the Moon, the Purna Kalasha, Ajarapurusha and Mahanaga, adorn the struts that support the roofs. The temple complex also houses several other shrines. To the north is the shrine of Lord Brahma and to the northeast is the popular shrine of Lord Vasuki, the Lord of Nagas. On the southern side is an ancient 'Licchavi' Linga known as ' Chadeshwar' and a 'Dharmashila'. The antiquity of the temple may be dated to around 400 CE. However, Supus Padeva, an ancient king, is believed to be associated with construction of the temple based on an inscription from the period of king Jayadeva II, erected around the middle of the eighth century CE. The temple is also believed to be reconstructed by King Shivadeva (1099 - 1126 CE). Historical records indicate that Sultan Samshuddin of Bengal attacked the temple around the middle of the fourteenth century CE and it had to be reconstructed by King Jayasimha Ramvardhana in 1360 CE. There have been many renovations and enhancements over the years. King Jyothi Malla is associated with one such renovation in 1416 CE. Much of the present structure can be credited to Queen Ganga Devi under the rule of King Shivasimha Malla in the sixteenth and the early part of the seventeenth centuries. Legend has it that Lord Shiva fled from other Gods and took the form of a gazelle in a forest on the banks of the Bagmati River. However, the Gods discovered him and in trying to escape to the other bank of the Bagmati, broke one of his horns into four pieces. Later, the Lord manifested here as Lord Pashupathi , represented by a four faced linga.